We’re all probably familiar with U.S. 93, the main and most popular highway between Wickenburg and Las Vegas. The road runs for 200 miles, and is the most common route for Phoenix drivers who want to get away for a long weekend. In addition to being a popular road, the highway recently acquired another title—this one not so nice. 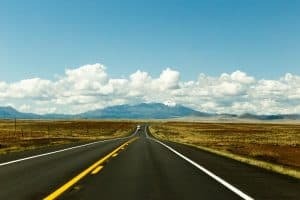 The consumer website Value Penguin ranked the 50 most dangerous roads in the United States, and U.S. 93 came out on top. The site put together its rankings by studying federal car crash data. This data included the total number of people killed in accidents as well as single-vehicle accidents. According to their report, there were 70 fatal crashes—with 90 deaths—on U.S. 93 between 2010 and 2016. The highway also takes a fourth-place spot on Value Penguin’s list of the worst highways for emergency medical service wait times. The average wait time on U.S. 93 for an emergency vehicle is 21 minutes. That same stretch of road, however, is where construction on the first phase of Interstate 11 is set to begin. Over the past decade, the Arizona DOT has put nearly a half billion dollars into widening the highway, most of which is expected to become part of I-11. Alberto Gutier from the Arizona Governor’s Office of Highway Safety spoke to KTAR News about U.S. 93, telling them he believes the highway has actually improved over the past few years. “I have been traveling 93 from Phoenix to Las Vegas for over 50 years and I could tell you that this is one of those highways that has seen incredible improvement,” he said. The Arizona DOT declined to comment on the study, but said in a statement that nearly all crashes and traffic fatalities stem from driver behavior. Some of the fatal crashes on U.S. 93 include a 2017 accident where two Chandler Unified staff members were killed, and another where a sedan hit a pickup truck head-on. Another multi-vehicle accident left three injured and two dead. Arizona’s Interstate 10 and SR-95 also made appearances on the Most Dangerous Highways list, coming at 12 and 33, respectively. When you’ve been injured in a car accident that wasn’t your fault, the lawyers at Plattner Verderame, P.C. in Phoenix can help. Our legal team will work with you to seek compensation for your injuries and losses, and protect your rights while you rest and heal. Get in touch with our experienced trial lawyers today by calling 602-783-8793 or filling out our contact form.